GUALFIN, Argentina – The herd first appeared as a cloud of dust coming from the northwest. It would take another two hours for us to hear the cows mooing and the gauchos yipping and yelling. In the tumult of the roundup, cows are separated from the calves. Both call out desperately until they are reunited. Then they moo for other reasons – probably a general disgust with having been whipped by the gauchos and harassed by their dogs for the past three or four hours. We didn’t join in driving the cattle this morning. Gustavo, the new ranch foreman, politely asked us if we would mind giving up our horse to one of the gauchos. We weren’t sure whether Gustavo thought he was doing us a favor… whether he really needed the horse… or whether he was worried for our safety. Last year, he saw us fall off our horse while trying to stop a runaway bull. He wouldn’t want to see his boss trampled; it would slow down the whole process. $1,950 is a lot of money for a few books and a couple of stock picks. I appreciate that you want to expand your asset base to benefit your descendants, but you’ll need to do it without my participation. When one of our affiliate groups published Chris’ research, they priced it at $49. Other readers have noticed, too: There’s a big jump from $49 to $1,950. Why? Are we just greedy? “Elasticity of demand” is what economists call it. We noticed it, too. You price something at $49, you get a lot of buyers. You set the price at $1,950, you get a lot fewer. If the elasticity is perfect… you get the same amount of money almost no matter what price you put on it. So, from a cash flow point of view, it made little difference (at least, in theory… but also backed by substantial experience) which price we put on Chris’ new service. “Greed” or “expanding our asset base” had nothing much to do with the choice of the price. Of course, we always want to expand our asset base; our company is not a nonprofit. We’ve been in this business for 36 years. We think… and hope… we’ve gotten better at what we do. Not only have we made progress in understanding how the investment world works, but also we understand better how our readers and customers react to it. Initially, we didn’t know whether Chris would succeed in making his readers money. It took 10 years to find out. During that time, readers could test him themselves – for less than the price of a newspaper subscription. And since neither we nor Chris’ readers knew exactly what we had, probably neither of us got the full value of his research. Subscribers came. And went. They bought. They sold. Nobody – maybe not even Chris – understood how valuable his recommendations were or what to do with them. But now we see that Chris is an excellent long-term, value-oriented investor. As we’ve been telling you, over a 10-year period, Chris’ recommendations beat the overall market three-to-one… beat Warren Buffett’s Berkshire Hathaway two-to-one… and turned every $10,000 into nearly $50,000. But you can’t make much money trading in and out of his recommendations. You have to buy and hold. And you have to be willing to sit through periods of substantial drawdowns. Most investors – and we use the term loosely – do not expect that from a $49 service. They want big ideas. They want speculations. They want to trade. They want more immediate gratification. Putting the average investor together with Chris is not good for either. Bonner Private Portfolio is for more serious, long-term family investors. It requires readers who understand how value investing works…. and are willing to stick with it. It’s not exciting. There’s not much to talk about. There are few occasions for bragging about your results (unless, that is, you have plenty of patience). So, for Bonner Private Portfolio, we did not want a lot of readers; we only wanted the few who were suited to it. That’s why we deliberately put the price high: to discourage casual subscribers or those who had not enough money to make it worthwhile. We want serious subscribers who understand and appreciate the service. You can’t just “try it out for a few months.” You have to stick with it. Is $1,950 the right price? We don’t know. But judging from the results, it might have been too low. We have more subscribers than we expected. That may be because the serious investor compares this service – as he should – with a managed account. If he puts his money with a value-oriented manager, he will pay upward of 2% a year (if you’re lucky). With $500,000 invested, that works out as $10,000 a year. The serious investor with serious money sees that Bonner Private Portfolio is a bargain at $1,950. Almost every investment approach works sometime for someone. But none work all the time for everybody. Some are meant for serious, long-term wealth building. Others give traders and speculators the adrenalin rush they look for. Some are good for sophisticated investors with a lot of money. Others are more appropriate for people with little money and little experience. Putting the right people together with the right service is still hit or miss. But we’re getting better at it. And pricing Chris’ new service at $1,950 is a step in the right direction. If the advice turns out to be good, no one will complain. If not… well, we will have learned something. 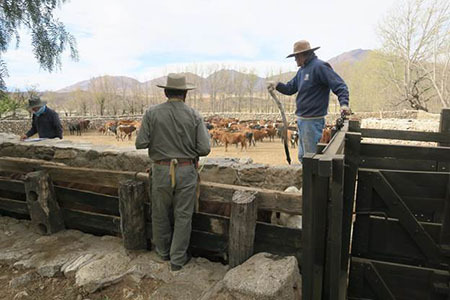 After the cows arrived at the corral, the cowboys – Gustavo, Samuel, Pedro, and Natalio – dismounted. We were all pleased to see Jorge drive up. He couldn’t resist the roundup. He had come to advise… but soon, he had his work clothes on and a large hypodermic needle in his hand. He is retired, but he took charge of the vaccinations nonetheless. Everyone had his job to do, including your editor. The young boys – changos, Samuel and Pablo – whirled their lassoes over the heads and yelled at the cattle… wading into the herd to drive them into the entrance to the manga. The manga is a long funnel, built of high stone walls, where the cattle are compressed into a single file. This leads to the wooden chute, where a number of doors and yokes allow the cowboys to go to work on the animals one by one. The cows ran around trying to avoid the entrance to the manga; they must have known that they wouldn’t like it when they got in. A cloud of dust rose over the corral. And gradually, by groups of three or four, the animals went where they were supposed to go. Then, the changos closed the gates, mounted onto the stone walls, and walked along the top, poking the cattle with long sticks to force them forward. Samuel even had an electric cattle prod – the first one we’ve seen at the ranch. When, finally, they got into the wooden chute, the gates were closed in front of them and behind them. The cows locked in place, Jorge administered a shot of anti-parasite vaccine. Geraldo (not one of our crew, but a man authorized by the government to oversee vaccinations) gave them an extra shot against brucellosis. Gustavo wrestled with the calves, putting a piece of yellow plastic in their noses to prevent them from nursing from their mothers. Then he cut off the ends of some of the tails, which he must have judged either unaesthetic or unhealthy. We operated one of the gates… responding to the calls from Jorge – arriba or abajo (up or down) – depending on which direction they were to be sent. The ones that went abajo would be sent back into the big valley they came from. The others would be marched up to the high valley at Compuel. We did not understand the selection process, but there was no time to discuss it. Opening and closing the gate would seem to be the easiest job around, but we soon realized that it came with its own responsibilities, dangers, and challenges. “Close the gate,” Jorge would yell… giving us only a second or two to react. Sometimes, it was too late. Once a cow – or worse, a bull – had his head past the gate, it was impossible to stop him. And now and then, a cow would be driven mad by the experience. One, with horns, leapt at us from in front of the gate, trying to get over the wall and out of the manga. We jumped back in time to avoid being gored… but we stayed on our toes the rest of the day. The whole scene was one of dust, noise, and action. The cowboys whipped, prodded, and lassoed – all the while yelling threats or encouragement to the cows. The older gauchos delivered their medicine and made their judgments… always calling to one another over the mooing cattle and the general hullabaloo. Occasionally, a calf would get trampled in the manga. The larger animals – including huge bulls – would walk over the poor little calf, leaving it for dead on the ground. Sometimes, the calves get trampled to death. But yesterday, both of the victims soon revived. Each time, Gustavo jumped down to the ground, grabbed its head and held it up. Jorge was fast behind him. Needle in hand, he gave the calf a shot. Within a few seconds, the calf seemed to come back to its senses and struggle to its feet. When the sun set, we had finished the work – processing 195 cows and 83 calves. P.S. “If you want to be informed rather than disinformed, go to The Daily Reckoningwebsite and sign up for the free Daily Reckoning letter.” That’s what one leading author said about the free daily email edition of The Daily Reckoning. Don’t miss out another day. Click here now to sign up for FREE.